The muscular system is a set of tissues in the body with the ability to change shape. Muscle cells contain a variety of proteins which help them contract in size. The proteins form fibers, which connect various parts of the cells. The main proteins used are actin and myosin. 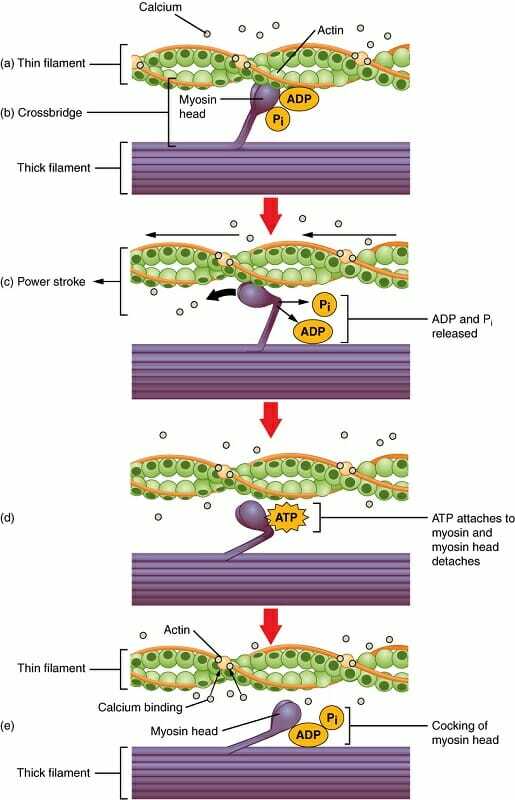 As seen in the graphic below, the muscular system contracts when energy from ATP is applied to the myosin heads of the myosin protein filament. The head releases the actin, reaches forward, and grips the actin again. This moves the protein filaments and contracts the fiber. Depending on the muscle cell, different forms of actin and myosin can be used. In some organisms, completely different proteins are used. The most obvious function of the muscular system is movement. Organisms have adopted a variety of methods to use the contractile function of the muscular system to move through the environment. The most basic movements of fish include contracting muscles on opposite sides of the body in succession. This action propels them through the water. In organisms with limbs, tendons and other connective tissues are used to secure muscles to the joints and skeleton. Skeletons may be internal like the human skeletons, or they may be external like the exoskeleton of crabs. The nervous system coordinates the contraction of the muscular system to synchronize the movement of the limbs. Animals like the cheetah, swordfish, and bat have obtained speeds above 60 miles per hour or more through the power of their muscles alone. The second and less obvious function of the muscular system is to assist with circulation. Visceral and cardiac muscle tissues surround the blood vessels and lymph vessels that carry crucial nutrients and oxygen to the cells of the body. Cardiac muscle makes up the heart and supplies the main force for blood traveling through the body. Large arteries and veins have associated muscles which can contract or relax to control blood pressure. The actions of large skeletal muscles also help pump the blood and lymph fluid throughout the body. While you exercise and contract large and small muscles, they push vessels aside, which works like a pump to move fluids around your body. Much like its ability to move fluids through vessels in the circulatory system, the muscular system also aids in moving food through the digestive system. Most digestive organs are surrounded by smooth muscle tissue. Although the tissue cannot be voluntarily contracted like skeletal muscles, it is controlled subconsciously. When food needs to be moved through the gut, the muscles contract in a synchronized fashion in a wave through the digestive system. These wave-like muscular contractions are called peristalsis. Unlike other organ systems, the muscular system is divided into different types of tissues, which are incorporated into various organs in the body. Striated muscle, or Skeletal muscle, is the tissue most commonly associated with the muscular system. This type of muscle attaches to the skeleton and moves the limbs and body of an organism. Skeletal muscle systems are composed of striated muscle which has distinct bands of proteins in each myofibril. When these proteins are given energy, they slide past each other, pulling the ends of each muscle cell together. The sarcomeres, or function units of actin and myosin, produce the banding that can be seen in striated muscle. This can be seen in the image below. By contrast, visceral muscle cells do not contain these stark bands of protein, and the actin and myosin fibers work differently. 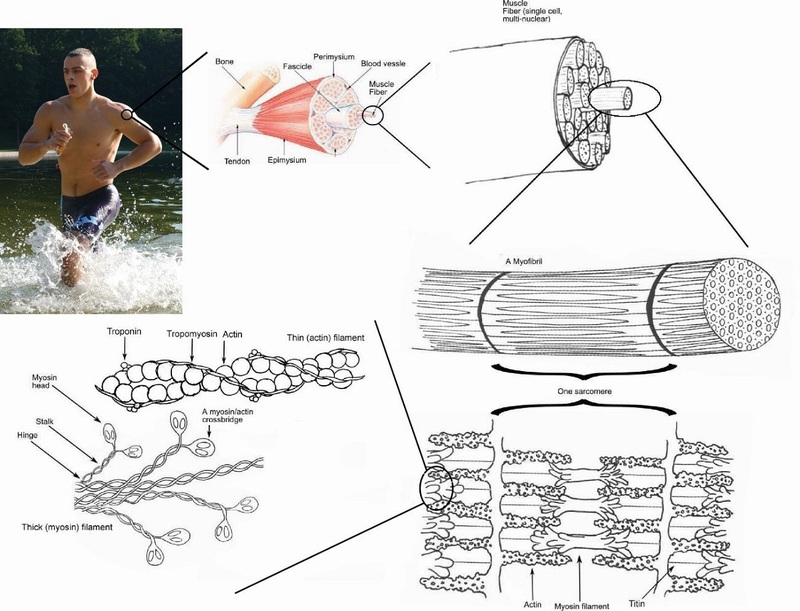 Instead of think fibers than run through the cell, visceral muscle is surrounded by a net of actin and myosin fibers, which squeezes the cell when contracted. This can be seen in the image below. Visceral muscle is also known as smooth muscle for this reason. Cardiac muscle, which surrounds the chambers of the heart, is striated like skeletal muscle, but the cells are connected to adjacent cells, which creates more of a contractile motion to pump the blood. In general, the muscular system has a basic structure which allows muscles to move limbs and create force. A muscle is always situated between two bones, connected to the bones via tendons, which are fibrous and flexible tissues that can attach to bones. The action of each individual cell shortening causes the muscle to shorten as a whole. This pulls on the tendon on each side of the muscle, causing a force on the bones. The bones, if they are connected to a joint, can move in response to this force. Some bones are stationary, which allows the muscle to pull against them. This is the case with muscles like the diaphragm, which is connected to two stationary bones. When the diaphragm contracts, it forces the air out of the chest cavity because all of the force is directed upward. Together, the many different types and connections of muscles function to allow your body a complete range of movement. Thus, many muscles cross over each other or are on opposite sides of a bone to move it in different directions. Skeletal muscle is connected mostly to the somatic nervous system which is controlled by voluntary impulses from the brain. The cardiac and visceral muscles, on the other hand, are controlled largely by the autonomic nervous system, which controls the subconscious actions of an organism. The separation of these nerve systems ensures that the autonomic functions like breathing and digestion continue to take place as an animal moves about and searches for more food. 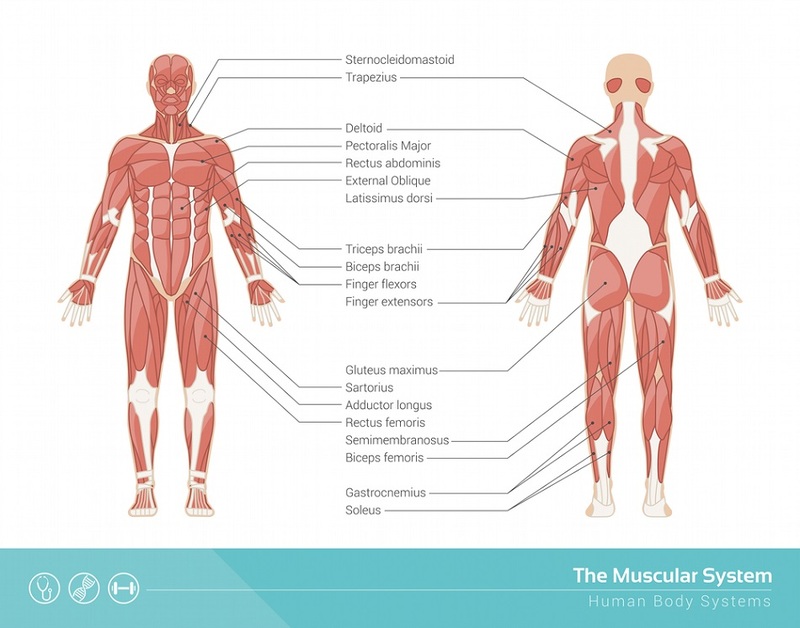 The difference in muscular system tissues is due to their very different uses. Skeletal muscles must be able to do a large amount of work quickly, therefore they consist of striated muscle cells, which can contract voluntarily. The smooth muscle tissue found in visceral tissues has fewer energy-producing mitochondria. These tissues are simply used to contract hollow organs and move the fluid inside. The stomach, intestines, and blood vessels are lined with visceral muscles. Cardiac muscle is striated because it needs to produce lots of force, although it is not controlled voluntarily. 1. Lymph fluid is important in fighting infections because it helps immune cells reach all of the tissues of the body. When you get sick from viruses or bacteria, these immune cells are needed to capture and destroy the invading pathogens. How can exercising regularly help you stay free from infection, and help you get better when you are sick? A. Exercising will do nothing to help your immune system. B. By circulating the lymph fluid with muscle movement, the muscles help carry immune cells to the site of infection. C. Exercising will decrease the amount of oxygen in your tissues, making it harder for pathogens to survive. 2. The muscle that controls your lungs is called the diaphragm. The diaphragm is a thin sheet of muscle that extends across the bottom of the chest cavity. While you can hold your breath for a while, once you pass out your body will resume breathing for you. Is the diaphragm connected to the autonomic or somatic nervous systems? 3. Why are there no distinct organs in the muscular system? A. The muscular tissues span most of the other organ systems, though it forms no organs of its own. 4. There are three basic types of muscle. Which of the three can be completely replaced by modern medicine? 5. Which of the following is a true statement?